The wider zone of Alan is actually an area of several spacious grassland valleys and meadows, with picturesque peaks rising above, predominantly oriented towards the littoral side of Velebit. In addition to the beauty of the surrounding peaks, the area of Alan is also popular due to the Alan mountain hut located along the route of the Velebit Hiking Trail (VPP) and the Premužić Trail. Views towards the sea from this area, with islands of Rab and Pag clearly visible, belong to the most impressive sights of Velebit. 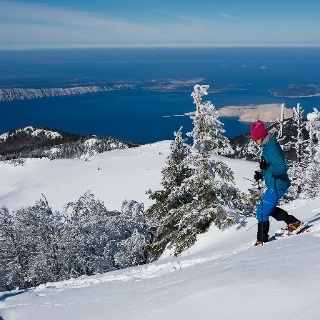 Šatorina and the high mountain area around it are the key areas of central Velebit. Below Šatorina and a somewhat lower area of Matijević brijeg, there is a range of abandoned karst fields on the littoral side – they represented a very important source of livelihood for the locals and their livestock until the mid-20th century. On the continental side of the mountain, below Šatorina, we come across the valley of Štirovača cut deeply into the terrain and covered in valuable and well known virgin forest. In the area from Alan to Ravni dabar, hikers can use mountain shelters at Ograđenica and Skorpovac, as well as the facility of Kugina kuća on the road that links Štirovača and Dabri. 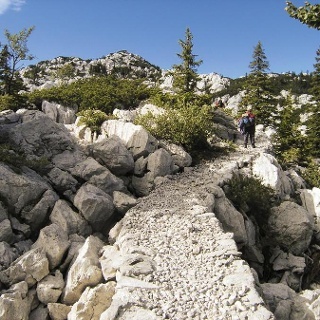 These facilities serve as main support for climbs to the peaks of central Velebit. In this part of our exploration, we will continue following the Premužić Trail and the route of the Velebit Hiking Trail. After 15 minutes of hiking from Alan, the Premužić Trail enters the littoral area of the mountain. There is a marked branch to the left, leading to the peak of Zečjak. The Premužić Trail continues steadily along the littoral slope without major elevation changes, taking us through a series of meadows and forest sections for two hours and a half of hiking to a place in the forest where we come across the first trail branch to Šatorina via Ograđenica, to our left (2 hours of hiking). Along this route, 20 minutes of hiking above the Premužić Trail, we come across the mountain shelter Ograđenica, located in the middle of the route from Alan to Dabarska kosa, and suitable as remedy in rough conditions. From an intersection below Ograđenica, the Premužić Trail descends along the upper edge of the karst field of Mlinište to the spring of Gornja korita – where we come across another trail branch, steeper but shorter, leading to the left to Šatorina. Continuing further across a small mountain pass, we reach the upper edge of the spacious field of Radlovac, and pass above the field to its southern end. This was once a very important site for livestock farming, a practice almost completely abandoned in the area today. After Radlovac, the Premužić Trail continues through the forest. To the right, we come across a branch descending to the abandoned hamlet of Pejakuša. To the left, before Skorpovac, there is a connecting trail leading to Kugina kuća (one hour and a half of hiking). In Skorpovac, there is a mountain shelter of the same name. Easy trail with gorgeous views over the sea, some cross roads but easy to follow with a map. Skorpovac hut free to stay in and the guy running it is very friendly. He doesn't really speak English but his German is good, his dog is very cute and he still has beer :) there's water at the hut. Again even without the views it's great to be here. There is water down near Ogradenica.